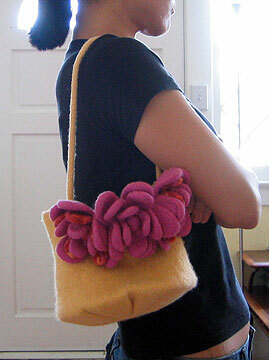 the handle needed to be sewn a little closer to the front than dead center to balance the weight of the flowers. Once I pinned it all together, well, I couldn't wait and had to finish her off that night. So without further ado, here she is! I decided a closure would be wise, since it would be just like me to swing it over my shoulder and send the contents flying. I found a nice big orange button in my sewing canister (I may not be the greatest sewer but that doesn't mean I can't be prepared! 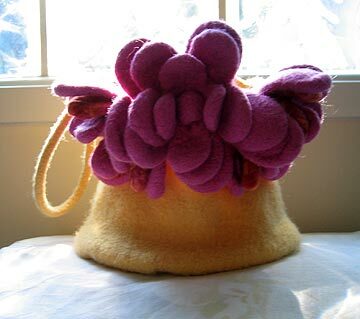 ), braided together three strands of the DB Soho, and sewed the ends underneath the center flower. It worked great! Plus, I can tuck the closure behind the flower when I want the bag to be open. 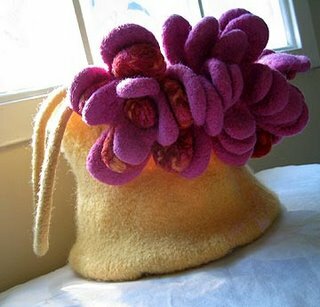 One of these days I'm going to learn how to embroider so I can cover those little sewing bumps with something fabulous. I'm glad it came out smaller than the pattern dimensions (most likely because I subbed the yarn). It's the perfect size for my wallet, keys, sunglasses, and cell phone! And I made the handle just long enough to sling over my shoulder. 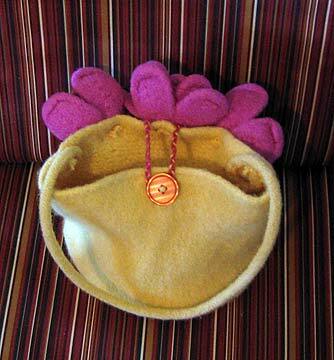 It was an easy-to-follow pattern, but I was a little skeptical as pre-felt it looked like Dumb Donald from Fat Albert. And post-felt it looked like Cousin It. And it was my first experience felting. But once it was blocked, my skepticism vanished! 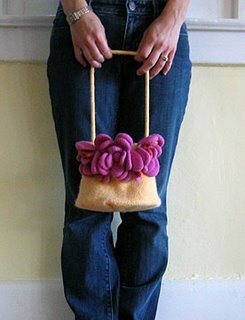 I love how this turned out, it is so cute and such a fun bag to carry around! Needles: Denise 11, 24" + 40"
Nice job! Looks like the ecowool felted quite well! i'm going to turn into a knitted bag ho, i can FEEL it! nicely done! it's so pretty!